Plantation House 1907. The Golden Wedding of Ann & Henry Hurt. See note below. Photo courtesy of V. Hopkinson. This is the house where I now live. It’s quite an extraordinary property, of which we know some facts and have learned a great deal since we moved in during 2001. We have carried out extensive renovations, which have revealed some of the house’s secrets. It was built sometime between 1860 and 1876, we know not exactly when. It was built for the ex-Manager of the Killamarsh Steel Forge (a Mr. Richardson) and was originally called Plantation House. 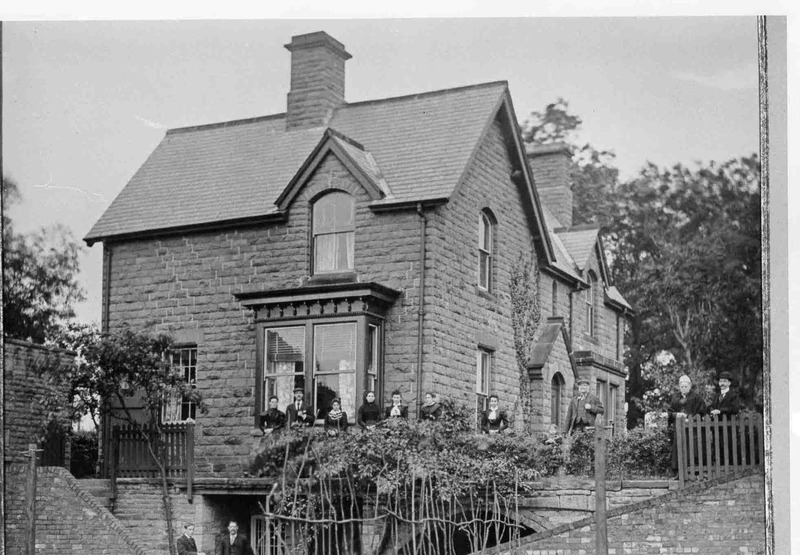 At some time in its history, the name was changed to Lock House, but actually the house is nothing to do with the canal, which used to run through what is now the back garden, but back in history this land didn’t belong to the house. The Lock Keepers cottage used to stand in what is now our back garden, but was demolished in the 1930’s we think. There are a lot of bricks in the garden which used to be the Lock Keeper’s cottage. We don’t know what the Arch / Tunnel was for, it is now blocked in by a large stone garden wall, but we think it is not filled in as the wall in the cellar which is the other side of the arch is bone dry, despite being underground. The arch has caused some structural issues with the house wall, pushing it inwards, despite it being 3 feet thick and solid stone. We have had to install steel structural supports in the cellar to prevent any risk of the wall pushing in any further. The house is effectively 3 storeys, with the cellars extending across the entire footprint and having high ceilings and fireplaces. They were clearly designed to be used by house servants, for cooking, storing food and living accommodation. The land which now includes the ex Belk Lane Lock in our back garden was purchased from British Waterways by a previous owner in the 1970’s. The modern bungalows on Primrose Lane, next to our house, are built on land that used to belong to the house. We would welcome anyone with local knowledge posting more information / photos about the house, in particular about the arch / tunnel, which at some point in the future we intend to expose, funds permitting! Plantation House 1907 – The Golden Wedding of Ann and Henry Hurt. Pictured: Emma, Arthur, ? ?, Ellen, Hannah, Martha, Ann, Henry, Ann, Edward, Herbert (all Hurts) and James Manchester, husband of Emma.